Toyo’s new load range *F* LT tires. Using ‘em hard. In decades past the transmissions, brakes, frames, and other items didn’t match the grunt of the medium-duty truck engines stuffed into pickups, but those inadequacies are mostly behind us. The constant improvement of these components could not support the increased ratings if light-truck (LT) tire capacities didn’t keep pace. There is possibly nothing less safe than not having enough tire (capacity, speed ratings, etc.) for the job. Manufacturers continually strive to meet market demands. If we ask for and buy, companies are happy to build stuff for us. There is science and some regulating body input that affects how much tires are rated to support. A simple way to think about tire capacities is to understand that it is the total amount of air inside a tire that supports the rated weight. That includes the physical volume/space inside the tire and the air-pressure. 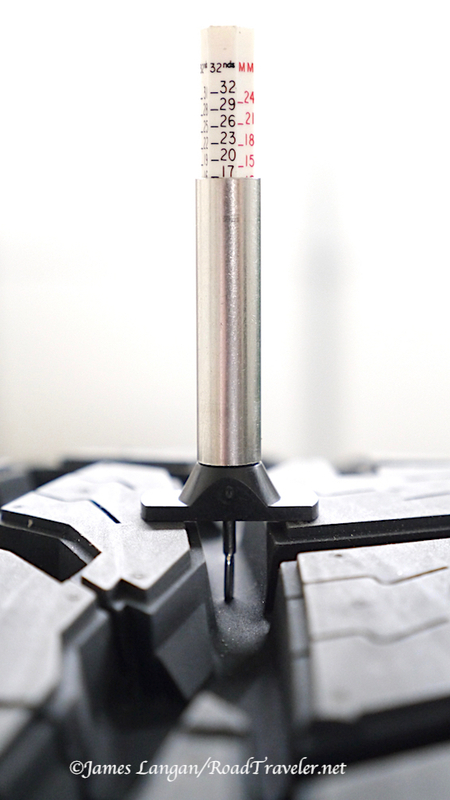 A tire of a given size that can accept higher pressures, is almost always going to be rated to carry more mass. More space and more psi equals more capacity in pounds. As simple as we try to make this, there is at least one combination of ratings that many find illogical. Most, but not all, load range (LR) E LT rubber carry their maximum rated loads at 80 psi, but a few are rated for a maximum of 65 psi. In addition to not supporting as much cargo, because of the lower pressure, trucks with a simple TPMS (tire pressure monitoring system), like a late model 2500 Ram/Cummins, will always have a TPMS warning light illuminated when running with less than the maximum 80 psi in the rear tires and/or 60 psi up front. The Tire and Rim Association (TRA) is the standardization body for this industry in the United States. It was established in 1903, and it is lead by top technical representatives from member companies. There are a few niche manufacturers who don’t belong to this association, and therefore may not abide by the industry standards, but they are few. The common tire sizes, load ratings, and capacities most of us use and are familiar with were created and sanctioned by the TRA. Traditionally, flotation sizes (33×12.50R17, 35×12.50R18, etc.) have received more conservative ratings, notably lower than those for LT-metric sizes. Why? Because the TRA says so. Maybe there is a technical and/or regulatory reason, but for the end user they are what they are, and we must pick a tire the meets our needs. Load range *F* 35×12.50R18 handles 3,970# at 80 psi. Toyo Tires is again leading the industry by introducing load range F tires in sizes that were formerly 65 psi, load range E. Toyo is making several in their Open Country A/T II and M/T designs, plus a couple for Open Country R/T. 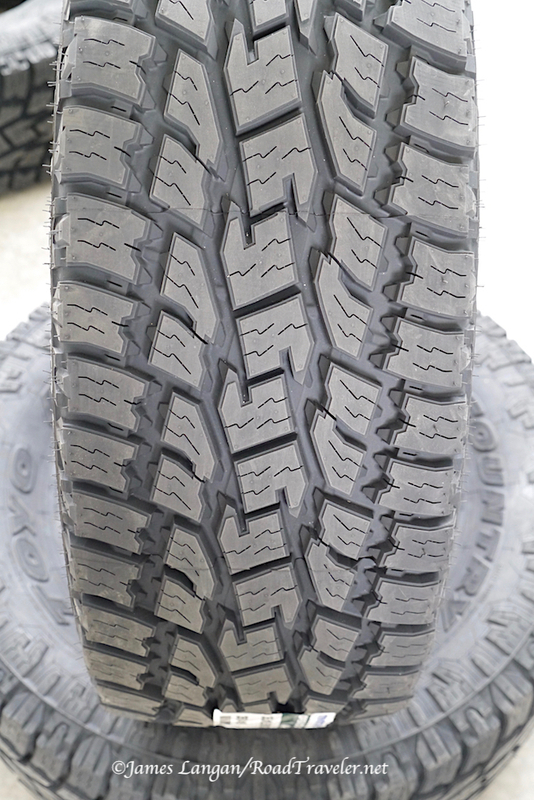 Toyo’s sister company Nitto was actually first to market with LR F light-truck rubber last year, but they are only offered in a few part numbers in one tread pattern, the Nitto Ridge Grappler. Nearly all of the new LR F products added to the Open Country line are in flotation sizes, instead of LT-metric. 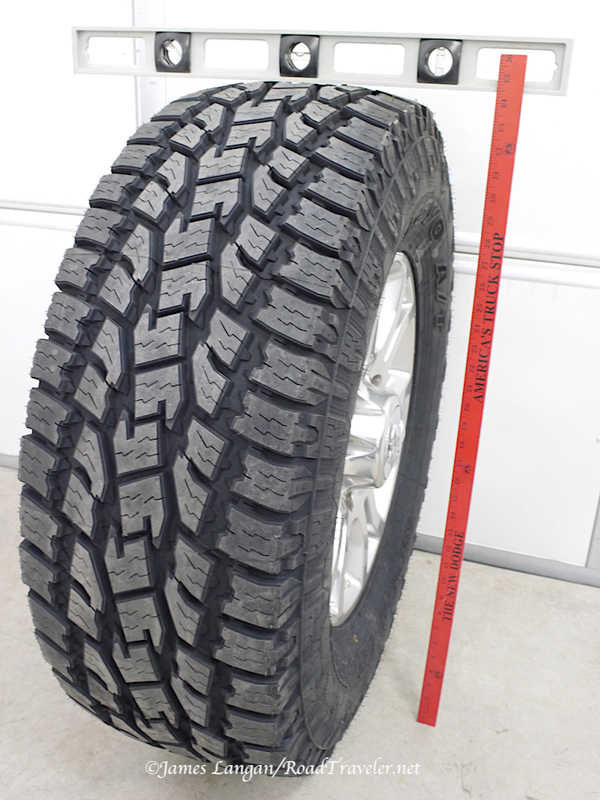 Two 35” tall examples of these different size formats are the LT305/70R18 LT-metric, and the 35×12.50R18LT flotation size. Both are roughly 35” tall by 12.5” wide, and made for 18” wheels. All of the new Toyo LR F sizes listed here are for taller, 18”, 20”, and 22” wheels. Toyo A/T II Xtreme, 35×12.50R18, 68#, not yet mated to wheels. The load range letter designations will surely continue, but they are a somewhat confusing standard because the psi and LR are not married like most consumers think, they’re merely going steady but occasionally flirt around. The older ply rating (or P.R.) standard is still used, and this is stamped on the sidewalls of many tires (i.e. 6-ply rating = LR C, 8-ply rating = LR D, and 10-ply rating = LR E) and is arguably irrelevant in the 21st century. The numbers do not mean a tire has that many body plies; they don’t. This is a holdover from the old bias-ply days, where the number of cotton carcass (body) plies helped increase the capacity. Tire technology has advanced a bit over the past several decades, and cotton plies are no longer used. If the ply rating designations are outdated and the load range letters can be misleading or confusing, what should we use? 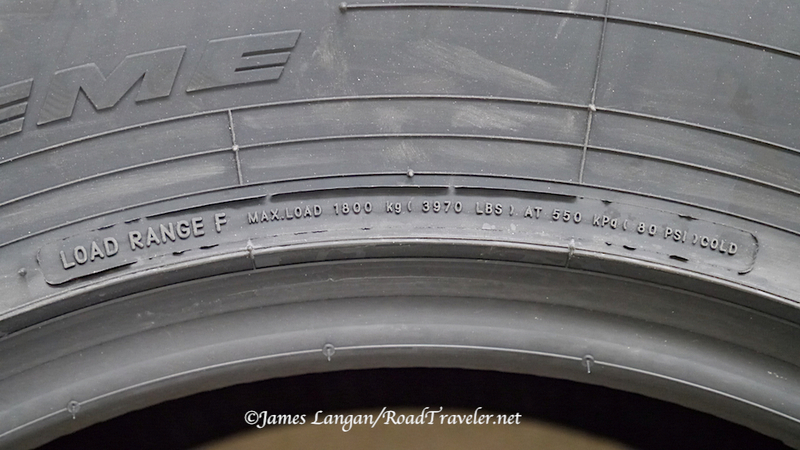 One tire engineer acquaintance suggests we use the load index, and I’m inclined to agree. Size, load index (128), speed rating (Q), and 12 ply rating. The load index is a number that indicates the maximum weight a tire can support when properly inflated to its maximum cold psi, and it is stamped on the sidewall like the other ratings and information. Using the load index, and/or the tire inflation charts that I’ve favored for over 20 years, removes much of the potential confusion, as it focuses on how much is supported at what psi. My push to start using the load index over (or in addition to) these older metrics starts here. It will be an adjustment. My 2014, 25th Anniversary Cummins Turbo Diesel routinely operates at its GVWR, so I welcomed the additional capacity of the new load range F rubber. As a fan of shorter and narrower wheels, I chose the Open Country A/T II Xtreme pattern in a 35×12.50R18LT. With the new load range F/12-ply rating, each tire is rated to carry 3,970 pounds at 80 psi. The load index is 128, the speed rating is Q, tread depth is 17/32”, and each tire weighs 68 pounds. For comparison, the 35×12.50R18 load range E A/T II has a load index of 123, which is 3,415 pounds at 65 psi. Increasing the maximum load by 555 pounds per tire is a big deal, and it is necessary for fans of big wheels and flotation sizes that haul heavy stuff. The Xtreme Toyos have decent void for a 5-rib all-terrain. Starting tread depth is 17/32”. “The New Dodge, America’s Truck Stop”, old-school measuring tool. Dynamic balancing always requires more weight because the tires and wheels are balanced in two planes, vertical and horizontal, instead of just vertical (the so-called static method). For these tall, wide, and heavy tires and wheels to require so little lead is impressive. Four tries requiring so little weight is what one might hope for when using the static method for a smaller, lighter tire and wheel package. Even doubling the numbers here would not be unreasonable for static balancing. Awesome Toyo! 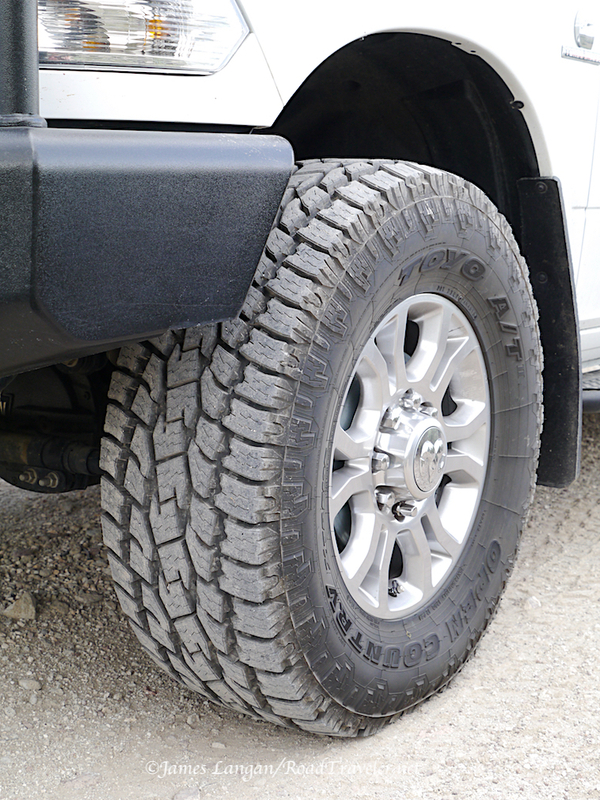 WBL Laramie wheels are slightly narrow, 8” vs. the 8.5” minimum recommended width for a 35×12.50R18 tire. They seem fine. Keeping the balancing data in-mind, it was no surprise that these Toyos were as smooth as glass at any speed on a good roadway. 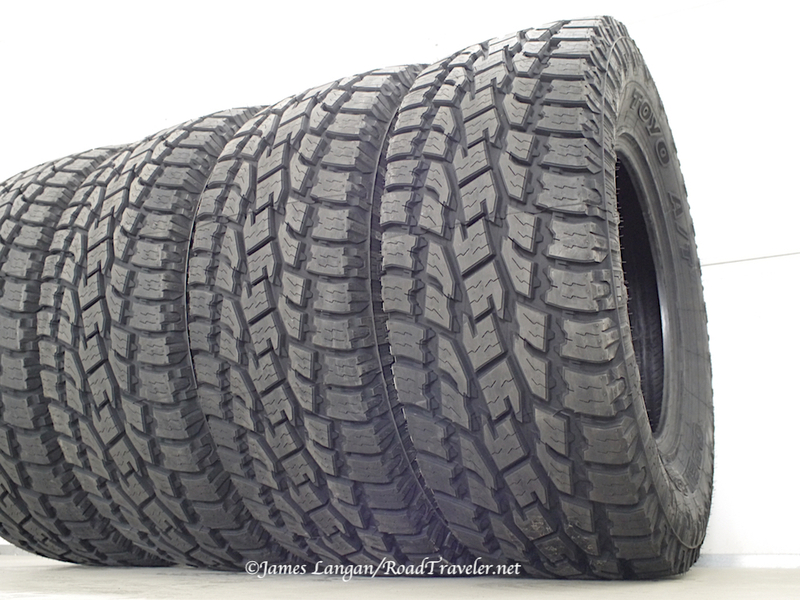 What about the difference between these new LR F Toyos compared to the same tire in a LR E? When I shared with friends I was running new LR F tires, a couple asked about the ride, assuming they would be stiff. Ride feel is appropriate, no stiffer or sloppier than a typical LR E 80 psi tire. Running 60 psi in front and 80 psi in the rear—the same as most other tires and sizes on my Ram when fully loaded—the truck is as smooth and stable as it would be with any 80 psi tire. The rugged and familiar 3-ply sidewalls and 7-ply tread of most Toyo Open Country LT designs felt just right. The obvious advantage of the new LR F is being able to carry more weight (load index 128) and not having a TPMS light illuminated when pumped-up to higher pressures. Field testing in remote Nevada. 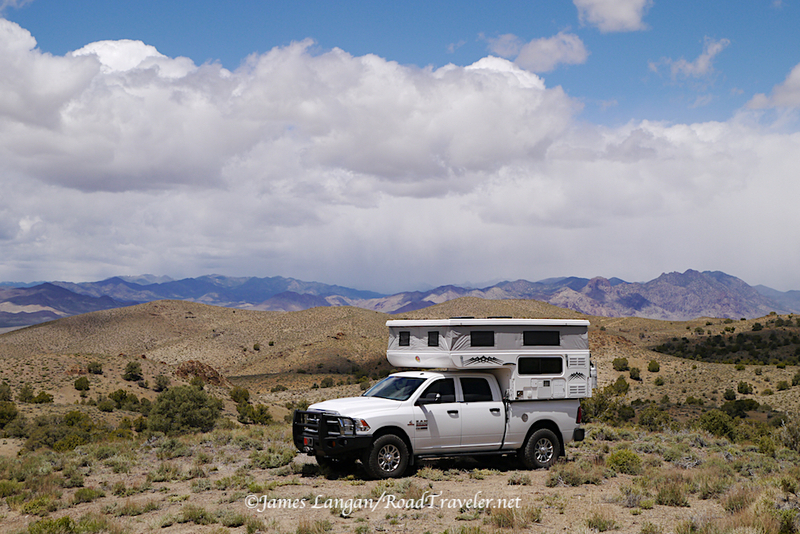 Humboldt-Toiyabe National Forest, east of the Big Smoky Valley, Nevada. These new 35×12.50R18 Toyos were mounted just days before driving from Reno, Nevada, to Flagstaff, Arizona, for the Overland Expo West event. Driving conditions and surfaces included a little city, plenty of high-speed Interstate freeway, winding rural highways, some rain, dirt and gravel roads, and even a bit of snow. 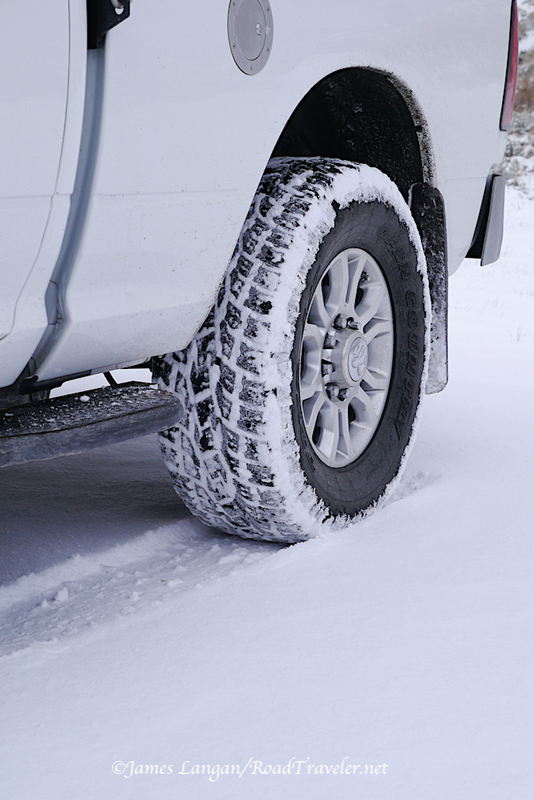 The Toyo A/T II is mud + snow rated, and does well in snow. 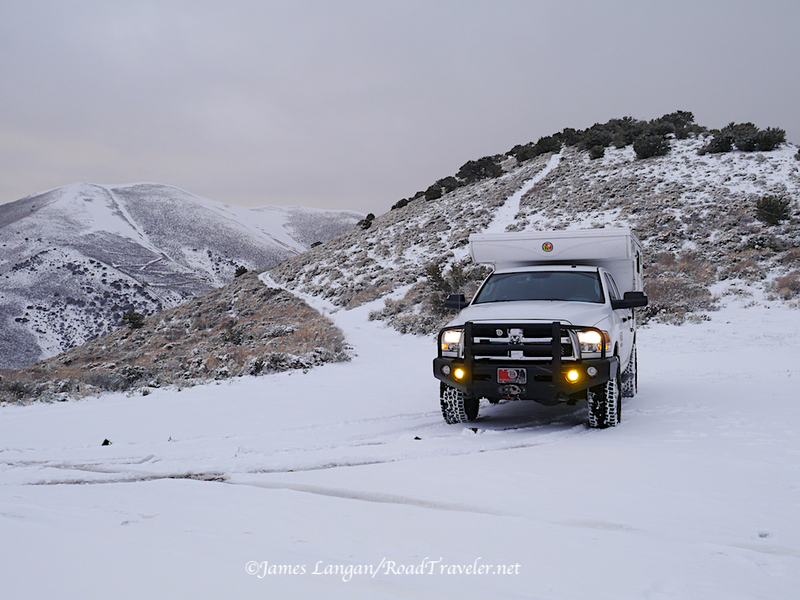 Being familiar with the tread, there were no surprises; the tires handled varied terrain well, as expected. 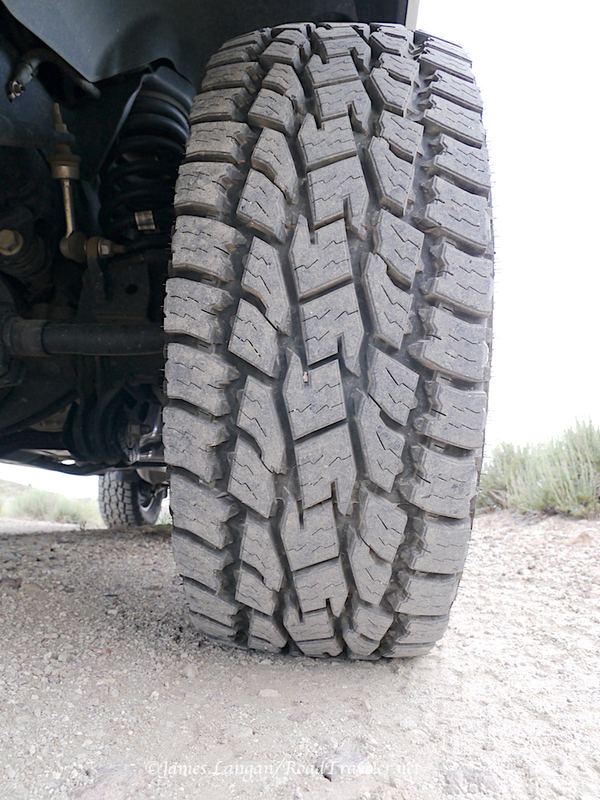 I’ve run the Toyo A/T II Xtremes before, and was happy to evaluate them again. This article was also published in the Turbo Diesel Register magazine.